What were they waiting for? Jurgen Klopp was available during the summer and Liverpool gave Brendan Rodgers another shot. Rodgers seems like a solid enough manager but you pounce when you can get Klopp. Liverpool didn’t make the same mistake twice and picked up Klopp after 8 games and turned it around to cruise into the Champions League, setting up years of glory…right? Well, maybe it hasn’t been smooth so far but even if the first part hasn’t gone according to plan, the second and more long-term view is very rosy for the Reds and Klopp is a big reason for it. Let’s take a birds-eye view of where Liverpool are now and where they are going. Liverpool are a very good shots team this year, but that’s not really new. They’ve been 2nd in TSR in three of the past five seasons with only 1 top-4 finish in the Real Table*. This year’s TSR of .626 is 7th best in all of Europe. The only teams with a better rate are Napoli, Juventus, Dortmund, Bayern, Real Madrid, and Man City. That is special company. Their company when it comes to PDO (basically goal% on both ends) is rather less distinguished. Only Bournemouth, Villa, Udinese, Levante, and Espanyol are worse at turning shots into goals and keeping shots from turning into goals. Here’s a quick report card on the rest of the big stuff. 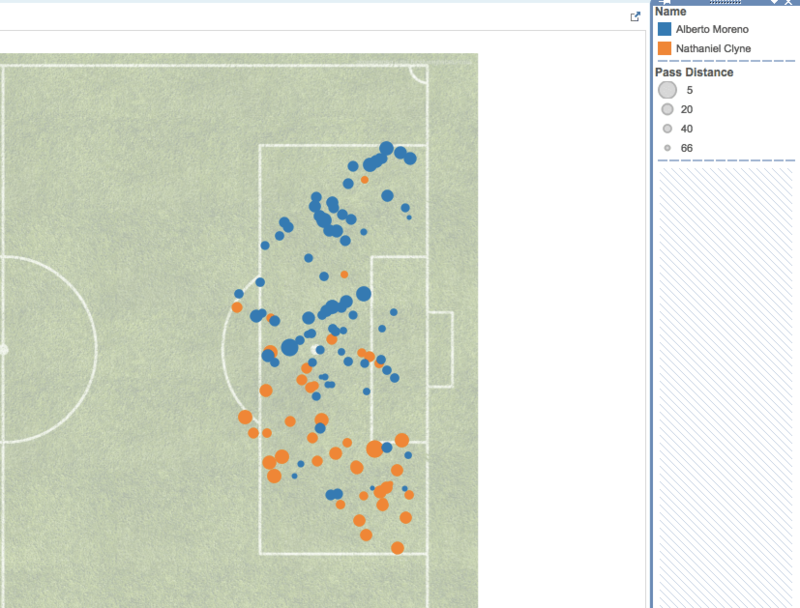 We very quickly see that Liverpool are performing right where they want to be on the big picture, most-repeatable stuff: holding the ball, pushing the ball into dangerous areas, keeping opponents from getting the ball into dangerous areas, accumulating shots, and preventing shots. In the Klopp-era all of these things shoot up even higher, to basically 2nd best everywhere. Unsurprisingly to those who have followed Liverpool closely, it’s at the final step of the process that the Liverpool machine breaks down. It’s business class from NYC to Dallas, and then Greyhound bus to El Paso. And yes, your seat-mate is smoking, does it bother you? The poor shot quality for and against helps explain their horrendous conversion rates and the 9th place standing. So what are Liverpool? Does the PDO represent a team who has no shot discipline and glaring weaknesses in defense or does that shot rate indicate this team is very close to becoming one a juggernaut? Let’s find out. Liverpool last year and at the start of this year were basically a Europa-level team when it comes to tilting the field in their favor. They were good at spending more time in front of the opposition goal than their own but not great, that’s changed under Klopp. Now no EPL team dominates territory like Liverpool. Chelsea, Man City, and Arsenal are still really good, but the Reds have done it more than anyone else. When you look through past seasons in different leagues, you essentially never find a team who is the best at dominating territory and fails to at least contend for the title. but the “very direct” category is not abnormal at all so they aren’t being torn apart. If they were being repeatedly shredded and caught upfield you’d expect the defense to break down in front of goal. We don’t see this at all. We see the opposite. No team has held opponents to a lower danger zone completion percentage than the Reds: 33.3%. So under Klopp Liverpool have managed to have a team that can press high effectively, keep teams from reaching the danger zone at an elite level and be the toughest to actually complete a pass in the danger zone against. Only Tottenham have anything like that all over the field and they can’t match up when it comes to keeping opponents away from the danger zone. There are really no weak spots. Only Spurs press high more effectively, no team faces fewer dangerous passes, and no team is harder to complete passes against. So why are they allowing so many goals (only 8th-fewest) with this incredible whole-field shutdown defense? 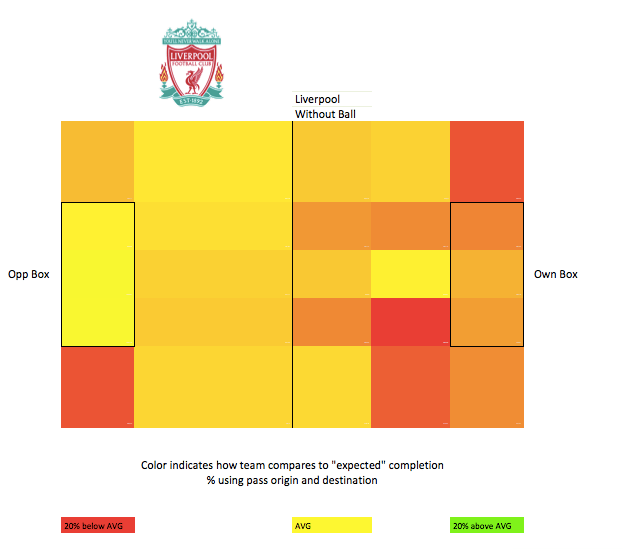 Liverpool SOT allowed from November-January using Paul Riley’s handy viz. We can see in Klopp’s first three full months, Liverpool allowed 18 goals and made 21 saves. Liverpool allow the both highest the goal% and the highest share of shots on target to turn into goals in the Klopp-era. If Liverpool and Leicester switched goal allowed rates, Liverpool would have allowed 10 goals in the Klopp era (instead of 30) and Leicester would have allowed 48 (instead of 16). This low save% is not because of some fundamental flaw in the Liverpool defense. They allow slightly higher quality shots than average but that’s inflated by a few brutal mistakes. If you look league-wide at only shots that are sub-.6 xG, Liverpool suddenly allow tougher shots than the average team. Basically there are 6 really high quality shots that make a big difference in the xG/SA rank, I’m willing to guess most came from ridiculous mistakes on a set piece or Kolo’s arthritis flaring at an inconvenient time (I still love you Kolo). These are not problems that should persist into next season. If Liverpool are simply average at avoiding boneheaded mistakes next year and replace Simon Mignolet (below average shot-stopper according to Paul Riley’s ratings and poor cross-handler) this problem will be solved. A league-average goal% is what you should expect next season. We know they can shoot. 3rd overall but in the Klopp-era we see even stronger numbers: 2nd shots, 2nd shots on target, 2nd in TSR, and 2nd in SOTR. Are they just chucking once they get close and not working the ball around? 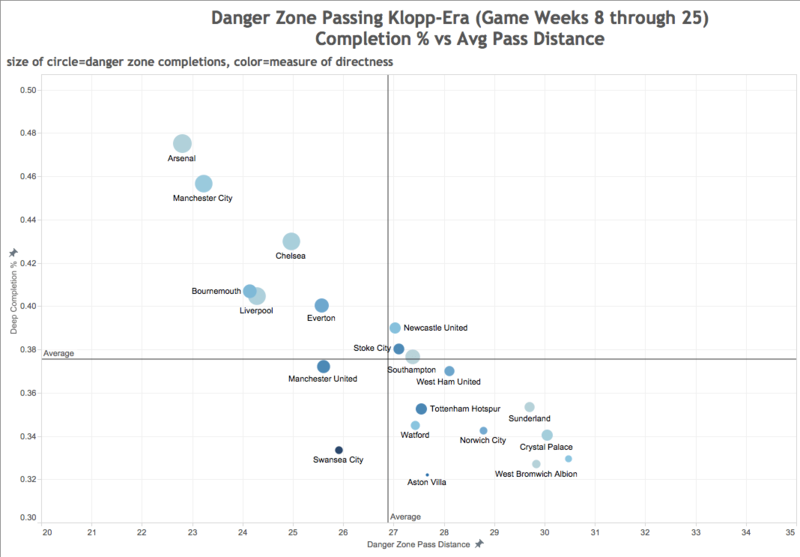 Absolutely not, no team plays more passes into dangerous areas than Liverpool under Klopp. Can they create any space to complete passes? Sort of. This chart can explain a lot: Liverpool have the most volume but can’t quite execute like the 2 powerhouse attacks of City/Arsenal as they are forced into slightly longer passes they can’t complete at as high of a rate. These two charts have a lot of luck in them, I am far from convinced Norwich and Sunderland have some sort of secret when it comes to creating great chances or that Swansea and West Ham have figured out how to stop them. We can conclude they haven’t quite gotten their share of elite chances while have given opponents more than their share. But given that Liverpool are still hovering in the middle even if they had their fair share of opponent mistakes and loose balls turned into tap-ins, how can they improve their chance quality? Parts 1, 2, and 3 are health from Daniel Sturridge and Coutinho, who have only started 24 of a possible 58 games and when both have finally been healthy in recent games the chances have been more abundant. Those are two of the best attacking players in Europe, and if they play together for a full season there is zero reason Liverpool won’t be much higher up this chart next season. To talk about the rest of the cast, we will go to a player rundown. -We’ve already talked about Sturridge and Coutinho where the question is basically just health. Klopp has toned back Coutinho’s wild shooting a bit, and playing with Sturridge will do that even more. After months of Benteke, suddenly Coutinho has options in front of him and a striker who can join in the play. -Benteke almost certainly has no future as a big-minute player. He just can’t pass the ball and isn’t a special shot generator or space-creator. No player on Liverpool has a completion rate below 74% besides Benteke down at 66%. -Roberto Firmino has swung wildly between being underrated and overrated several times this season. He is a great presser of the ball, routinely leading the pack in the fantastic AI Under Pressure charts so he has always provided value even when struggling early. He’s scored 8 and assisted 7 with strong key pass numbers but that has likely led to overheated expectations, he’s still wasteful with the ball at times (only Benteke has a lower passer rating for Liverpool, a measure of how well his completion% compares to expected comp%), not a shot monster and seems to not really have a clear positional home. There is monster potential here but still some development needed to be a really good attacking player. Defenders generally come out better than attacking players on these rough ratings, so Toure’s number is almost unimaginably bad while Coutinho’s is what you’d see from one of the best players in the league. –James Milner was never a good fit at midfielder, but has been boringly solid rather well out wide whipping in enormous amounts of crosses (6 per 90). -Jordan Ibe is a fascinating case, no player with >500 minutes has successfully dribbled as much as he has, he gets the ball way down the pitch to where he delivers passes from where Origi/Benteke usually do, he has great passing numbers as far as dangerous completions and a high passer rating yet he remains very frustrating to watch. The enormous dribbling numbers are a part of that, he doesn’t seem to play quick passes and holds the ball too long, but the potential remains sky high here. He’s only 20 and has a lot of strengths that 25 year olds would kill to have. -The midfield remains a bit hazy. Emre Can is kind of the Firmino of the midfield in that there is a ton of visible potential but he’s just not consistent yet. His passing is just not the high quality you want from your primary ball-handler though he is dangerous when he gets forward. He still edges out Henderson, who I think we can simply say at this point is not a great passer. Joe Allen is, my passing metrics really like him and Will’s plus/minus adores him. I’d love to see him get a long run but suspect his physical liabilities make him a bit of an unnatural fit for a Klopp side. 40% of the time I like the good old solid burger that assures me I won’t be leaking out of…my left side later. Those are some seriously unbalanced fullbacks. Why can’t we combine the two? Sakho remains one of the best center backs at advancing the ball in the league. I love Kolo Toure but his body is failing him and at this point he’s probably not even a top-end Championship player. Offseason shopping list: 1. keeper, 2. athletic midfielder, Lucas doesn’t have the legs to stay there much longer. Liverpool are in as good a long-term situation as they’ve been in recent history. They dominate the ball and tilt the field in a way that only Man City and Arsenal can match. This years weaknesses have come down to shot quality which has been heavily influenced by shocking and unlucky proportions of top-tier chances allowed and taken. These will likely even out a good bit without anything changing but the underlying causes there are those that have the easiest fixes: a new goalie, a new centerback and a healthy Sturridge and Coutinho. Without the ball, only Tottenham can claim to play nearly as well as the Klopp’s squad. If Daniel Sturridge can remain healthy, there is no more complete team heading into next season than Liverpool. Man City and Arsenal’s attacking firepower will make them slight favorites but Liverpool should expect to be the 3rd best team within touching distance of the top starting today and going into next season. Liverpool have the coach and the fundamentals and are right at the edge, the next step isn’t a hard one to make.